Arsenal manager, Unai Emery, has said that he has no injury problems over strike duo, Alexandre Lacazette and Pierre-Emerick Aubameyang, despite the pair pulling out of international duty. Lacazette was brought into the France squad to replace Anthony Martial, though withdrew a few minutes later with a groin problem, while Aubameyang turned down a call-up to the Gabon team due to a back injury. Both players were spotted during the training session at London Colney ahead of Sunday’s clash with Bournemouth, and Emery did not list them among his injury concerns. 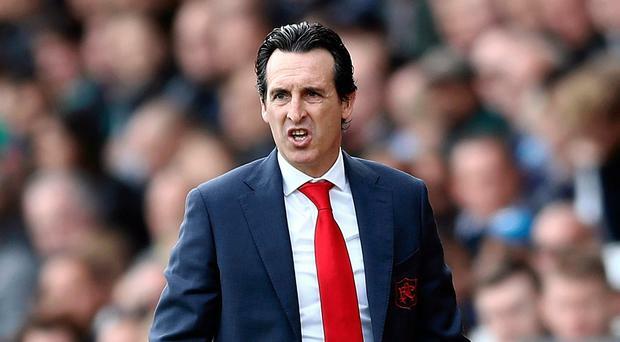 “Today all the players trained OK,’ Metro UK quoted Emery as saying at his pre-match press conference. “Only Danny [Welbeck] who has an injury and also Nacho Monreal now is not OK for Sunday. “Laurent Koscielny now is close with us to start maybe little by little taking minutes. It’s good news.